Border Security Force (BSF) is a major paramilitary force of India. BSF is the world's largest protector force. Its function is to prevent international crime and monitor the time frame of peace. (BSF) was formed on December 1, 1965. So our motto was how to get a job in the Youth Border Security Force (BSF). This border security force invites youngsters for various types of jobs every year. Whose qualification criteria are different. We will know which is the post and what is their criteria, qualifications and process. 1. Constable - This border is the main component of the security force. 2. Sub-Inspector - This is promoted to two-thirds and one-third posts are recruited. 1. Assistant Commandant - Assistant Commandant is recruited for 50% posts in which it includes SSCO and 50% posts are promoted to the Inspector. The release of vacancies of all these recruitments is published in the employment and daily newspapers. The non gazetted posts (Constable, Sub Inspector) are selected by the Staff Selection Commission of BSF. This recruitment is done on the basis of written examination, physical and medical examination in related categories by the Home Ministry of the Government of India. Gazetted posts Assistant Commodity is selected by the Special Selection Board of Central Police Organization. Selection of high positions is based on the service record over time. 1. Constable is the main component of BSF. The work of force depends mainly on the capacity and effectiveness of the personnel. Candidates with competency, competence and fitness in all respect are included as constables in the BSF. 2. The classification of the post is general non-gazetted in the Central Service Group. 3. For the appointment of the post of Constable (GD) in Border Security Force (BSF), male candidates will have to meet these eligibility criteria. Candidate should be 18 to 23 years old. There is provision for the exemption of reserved candidates as per the rules of government. 1. For the general candidate, the height should be 170 cm and the chest should be 80 to 85 cm. 2. There is a propaganda of reservation for reserved seats and candidates. 1. The vision of the eyes and the vision should be 6/6 and 6/9. 2. The candidate should be mentally and physically fit. 3. The candidate is not excused with any kind of disability or any other disease. The selection process of Constable (GD) is completed in seven steps. 1. Initial screening and physical measurement. 3. Physical Fitness Test (PET) - 1 mill race, high jump and long jump. NCC adds 10 points of game and technology. The final selection of the candidate will be done on merit basis in each category. Let me tell you that as per the instructions issued by the government from time to time, there is provision for the exclusion of Scheduled Castes, Scheduled Tribes, Backward Classes, Former Sanyaks and other Verghese Reserved. One-third of the underwriters are filled up by promotion and two-thirds are filled up by recruitment. Must be a bachelor's degree from a recognized university or equivalent. 1. For the general category, 170 cm height, chest should be 80 to 85 cm and 5 cm bloom. 2. There is a provision for exemption to reserved areas and candidates. 1. The sight of the eyes should be 6/6 and 6/9. 2. No part of the body should be deformed. 3. Candidates should be physically and mentally healthy. 4. There should be skill towards duty. Candidates selected in physical capacity examination are eligible for written examination. Written test for BSF sub-observer is of two types. Exam is 1 time 2 hours subject as follows. Exam is 2 time 2 hour subject as follows. Understanding the language as essay writing. The final selection of candidates will be done on merit basis in each category. In BSF, 50% of the assistant commandant is filled up by recruitment (10% SSCO is also included). And 50% inspectors are promoted by promoting them. 1. Degree from recognized university or equivalent and certificate of NCC B or C and certification in any sport will be given preference. 2. Technical-BSC Physical and Chemistry and Mathematics candidates are appointed as Assistant Commodity (Technical) These officers later work on higher positions of BSF Communications. 1. The candidate's age should be between 19 to 25 years. 2. There is a provision for exemption for reserved candidates. 1. Warm up man 165 cm Woman 157 cm, Chest should be only male 81 to 86 cm. 2. Men should weigh 50 KG according to the female height but not less than 46 Kg. 1. With eyes glasses, vision 6/6 and 6/9 should be closer and vision should be J1. 2. The vision of the eyes without eyesight should be 6/12 and 6/9 and closer vision J2. 3. The candidate should be free from any physical defects. 4. Physical and mental health should be good. 1. The candidate who is selected in the Physical Ability Examination is eligible for this examination. 2. Written examination includes questions of common knowledge, elementary mathematics and analytical experiment. The final selection of the candidate will be done on merit basis in written examination. Physical skill examination and interview will be as per the rules laid down by the government. Physical and Chemistry and Mathematics should have a 3-year diploma with 10 + 2 or equivalent 50% marks from the recognized institution and in radio and TV technology, electronics, tele-communication, computer, electrical, mechanical and engineering. 1. The age of the candidate should be 18 to 25 years. 2. Reserved candidates are exempt according to the rules. 1. Length should be in accordance with length of 86 cm for the normal class, with chest 81 leg, 86. 2. Regarding the fields, reserved and reserved candidates are exempted. 1. The vision of the candidate's eyes should be identical to J-I and J-II, 6/6 and 6/9 near sharp colors. 2. Physical and mental retardation should be healthy. 3. Any part of the body should not be infected with any disease. 1. The candidate is eligible for this examination which has been selected in the Physical Ability Examination. 2. There is a question of multiple object type of common knowledge, primary mathematics and analytical experiment in the examination. The final candidate of the candidate is done on the basis of written examination, qualification, physical skill test and interview. 1. Operator - Candidate should have 2 year diploma with matriculation, with any 50% marks in the field of Radio, TV, Electronics and ITI or 10 + 2 or equivalent Physics and Chemistry. 2. Fitter - Matriculation or equivalent and two-year certificate must be accompanied by engine fitter, diesel mackinin, automobile and motor mechanic or 10 + 2 or equivalent physics, chemistry and mathematics. 1. The candidate should be between 18 to 23. 2. Reserved candidates are exempt from the rules. 1. For normal class, the height of 170 cm, should be 86 cm on the chest 81 cm height, according to the length of the weight. 2. Rules are reserved according to reserved category. 1. A vision of the eyes of the candidate should be 6/6 and 6/9. 3. There should be no deformities in the body. 1. The candidate is eligible for the written examination which has passed the physical examination. 2. This examination consists of general knowledge, primary mathematical and analytical type questions. The final selection of the candidate is done on the basis of written examination, physical fitness, qualification and interview. 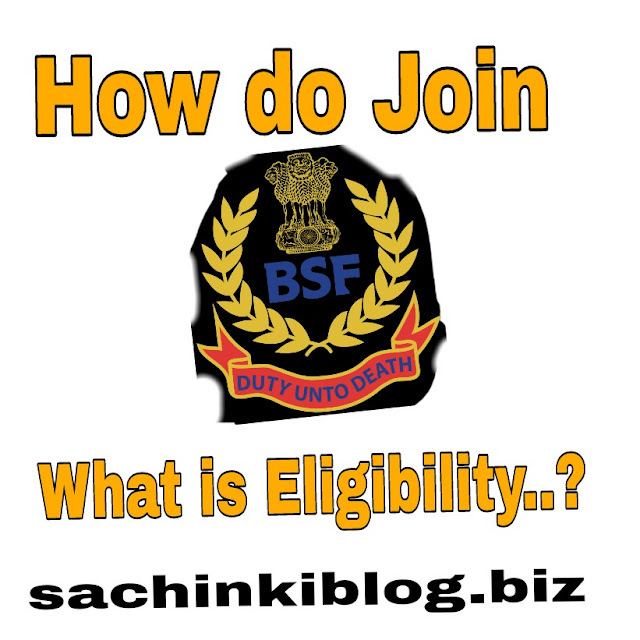 So this was the description of who you can join in the job of BSF and what is his procedure. From time to time, for information related to Border Security Force (BSF), get information from the official site of the organization.